Debasish is probably the senior-most amongst the current disciples of Pt. Buddhadev Dasgupta. Born in 1963 in a musical family, Debasish started training in music at an early age under his father Shyam Sundar Bhattacharya, who played the Sitar. 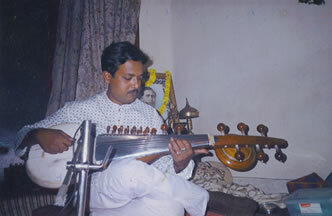 A few years later, Debasish moved to learning the Sarod from Ravi Laha, a disciple of Pt. Radhika Mohan Maitra. He became a disciple of Pt. Dasgupta in 1981 and has received extensive training from the maestro till date. Along with this training, he has worked hard to be recognized as one of the most promising Sarodias in India and an able torch-bearer of the Shahjahanpur Gharana. Debasish has earned accolades from his performances at premier music conferences all over India, such as the Prayag Sangit Samity annual convocation at Allahabad, Madhya Pradesh Kala Parishad conference in Bhopal, and the Vishnu Digambar Jayanti festival in New Delhi, to name a few. He is also a top-graded Sarodia on All India Radio and a lecturer at Rabindra Bharati University in Calcutta. Copryright © 2014, Soumya Chakraverty, All rights reserved.